Relax, America. Donald Trump is not an alien from outer space. He is one of us. American tradition has a place for him just as it does for Thanksgiving turkey, baseball and the genocide of the natives.A White House spokesman called Trump’s proposal to ban Muslims from coming to the United States “totally contrary to our values as Americans.” Paul Ryan said Trump is “not who we are as a party.” Have they read their country’s history or the polls?According to a Rasmussen Reports survey, 66% of Republicans favor Trump’s proposal to ban Muslims from entering the United States. The latest New York Times-CBS News poll gives his stand on terrorism 70% support among those likely to vote in Republican primaries. What are the White House and Speaker Ryan saying? Can the White House be referring to American values that include gun worship, police racism and non-stop foreign wars? Can Ryan be referring to the Republican Party that welcomed the old Dixiecrat Strom Thurmond when the national Democratic Party abandoned its long-standing commitment to racial segregation? Trump is in the right country and the right party, although we might lend him to the French if Marine Le Pen needs a hand. American history is replete with generations of populists like Trump who wanted to close the country’s doors to just about every race, religion and language group somebody didn’t like. It was the Catholic threat from the 17th century onwards, and it was the Yellow Peril in the late 19th and early 20th centuries. Anybody remember the Gentlemen’s Agreement of 1907 that effectively excluded Japanese workers from the US? Or the lynching of Chinese men and boys in Los Angeles in 1871? Or the longstanding practice of lynching black people that compelled Mark Twain to call this country “the United States of Lyncherdom?” Trump’s rap has roots in the Salem witch trials, the white knights in the white sheets, the sermons of Father Charles Coughlin and the purges of Senator Joe McCarthy. If Trump is not American, who is? From the beginning, our forebears in colonial Virginia and Massachusetts prohibited admission to Catholics. They murdered Indians and kept black people in slavery. They and their descendants sought to exclude Jews, Chinese, Japanese, eastern Europeans, southern Europeans, Mexicans, South Americans and anybody else who didn’t look fair-skinned and worship in a Protestant church. It’s the American way. One exception was William Penn’s Quaker outpost in Pennsylvania, which stood for everything Trump opposes. It welcomed not only Catholics, but Jews, freethinkers and, if any had shown an interest, Muslims. Trump would have hated Penn. The Puritans did hate him. The Know-Nothings, being generous with their prejudices, did not limit their hatred to the Germans. The Irish, refugees from starvation during the potato famine of 1847 and after, earned their greatest ire. Their “no Irish need apply” signs did not disappear from many employers’ windows until well into the 20th century. The Irish, of course, adapted and thrived. They absorbed the racial prejudices of their new land, often beating up Jews in the streets or burning down New York’s Colored Orphan Asylum during the anti-draft riots of 1863. The Know-Nothings had a cause: to keep America white, Protestant and Anglo-Saxon. 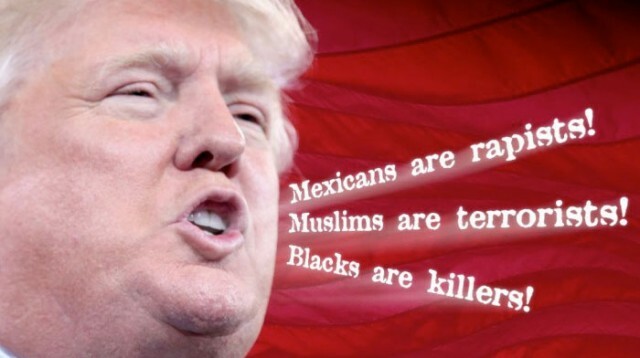 Trump has a cause: to keep out Mexicans, Muslims and anybody else he decides to pick on. The Know-Nothings took their exclusionary, not to say delusionary, notions into the electoral area and founded the American Party. If Trump loses the Republican nomination, he might consider taking that name for a third party run. Some Know-Nothings made it to Congress, where they railed against immigration and sought to ban Catholics from public office. One of them, the long forgotten Millard Fillmore, became the thirteenth president of the United States. To be fair to the electorate, they chose him as vice president. His president, General Taylor, whom Trump would undoubtedly admire for spending most of his military career fighting Indians and Mexicans, had the misfortune to die in office. Fillmore served only three years and was not reelected. Like it or not,Trump is as much an American as Martin Luther King. If it hadn’t been for people like Trump in the past, there would have been no need for people like King. You cannot wash racism, ignorance and demagoguery out of American history.. It is fatuous to say Trump is “not who we are.” He is who many of us were in the era of slavery and lynching, and who many of us are in the era of police shootings and Islamophobia.